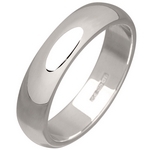 Sterling Silver Wedding Rings for both Men and Women. 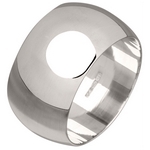 Our standard silver wedding rings are also known as a D profile due to the shape of the ring, rounded on the outside whilst completely flat on the inside. The amount the ring is rounded on the outside depends on the width of the ring, with the thinner wedding rings being noticeably rounded, whilst the wider the ring, the more shallow the profile. Our selection of rings in this range start at the thinnest women's 2mm silver wedding ring, up to our widest men's silver wedding ring at 12mm in finger size I to Z available. Each of our wedding rings is made from sterling silver, and carries a full UK hallmark on the inside of the ring. Our Silver Standard Wedding Rings have been rated 10 out of 10 based upon more than 1 customer reviews.